And boy are they loud. At 10:30 at night, it's loud enough to wake up my one year old from a deep sleep. What? NO trucks are supposed to be scurrying around side streets after 8 PM? Well, guess what, they scurry and barrel and do lots of other mischief. And these are big trucks. Not just your box trucks collecting grease (or whatever is in those big blue barrels) from International. These trucks are long-distance hauler trucks. Oh I know, I know. I can already hear the comments: You live in a city, get over it. Go back to (fill in a state I've never been) if you don't like it. But guess what? People who live in a city get to have some quality of life too. Creating less of a carbon foot-print than those who commute into the city doesn't mean having to trade in a night's sleep because of 18 wheels rumbling through your dreams. And there are long-time regulations set up that are supposed to keep some balance there. Several neighbors up the street have called 311 many times, and even reported certain trucking companies for rumbling about on non-trucking routes after 8 PM. It continues to happen every night and day. If it doesn't bother you, no worries. If it does bother you on your street, please call or email Marty, Mike, Joseph Palmieri (Brooklyn Commissioner for the DOT = 718 222-7259), and anyone else you can think of. 311 calls create a record of complaints, and especially if you leave your name and an email (which then allows you to upload photos and add on to the complaint) it can be effective. Even with a generous reading of the truck route information, there is no reason that such a high volume of trucks would need to use our side streets so often. Why Sunset Park? Well, we're between the Gowanus/BQE and major thoroughfares like New Utrecht and Fort Hamilton. But that's just a guess. McDonald is the next major local truck route, and 39th has the problem of strange angles and turns that trucks just hate. Why 44th Street instead of 39th? Hmmmmm. No traffic light or stop sign at the top of the hill? Could that be it? And could that be one of the hold ups for getting us a stop sign at 6th Avenue that would make it safer to cross the street into a MAJOR entrance to the park? Just speculation and suspicion, of course, but I'll put it out there. All vehicles defined as a truck (two axles and six tires, or three or more axles) are required to follow the Truck Route Network. An operator is allowed to travel on a street that is not a designated truck route for the purpose of arriving at his or her destination.When accessing such a location, the operator must leave a designated truck route at the intersection that is nearest to his or her destination, proceed by the most direct route, and then return to the nearest designated truck route using the most direct route. If the operator has additional destinations in the same general area, he/she may proceed by the most direct route to his/her next destination without returning to a designated truck route, provided that the operator's next destination does not require that he/she cross a designated truck route. The Local Truck Route Network is designated for trucks with an origin and destination for the purpose of delivery, loading or servicing within a borough. Trucks should only use non-designated routes for the purpose of accessing their destination. 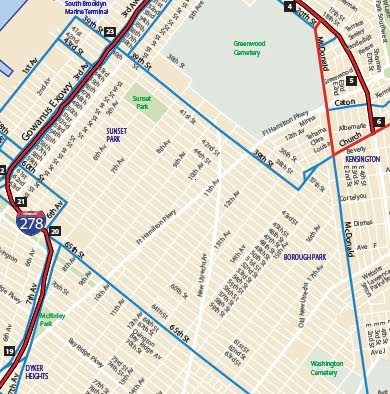 The Through or "Thru" Truck Route Network is primarily composed of major urban arterials and highways and must be used by trucks that have neither an origin or destination within the borough. Thank you for posting this. I feel like our street (32nd) gets more than its fair share of truck traffic, but it looks like I'm not alone. In fact, I noticed 33rd has a no trucks sign so I was thinking I'd find out how we can get one but it looks like they're not supposed to be on our street either, sign or no sign, except for deliveries on that street, right? I haven't noticed it myself, but some of my neighbors on 42nd street have complained about truck noise as well. There was a tow truck honking non-stop once though late at night. I think that was a different circumstance though. I wish they could add more routes and perhaps change the times so they are not going around during the late evening. Such narrow minded, as a daily truck driver, proud with my job, I can surly say that more the truck routes there is in such places the good it can be - more pleasant for truckers, car owners, pedestrians and the neighborhood residents..hope that someone will do something soon.